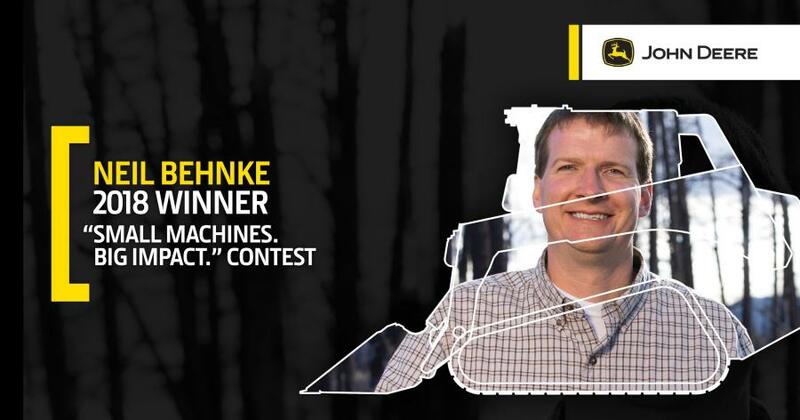 After all online and text message votes were counted, Neil Behnke, a volunteer with the nonprofit organization Black Forest Together, was chosen by the public as the grand prize winner of the second annual John Deere “Small Machines. Big Impact.” contest at the 2018 John Deere Classic Chairman's Dinner. As the winner, Behnke will take home his choice of a new model from the full portfolio of John Deere small-, mid- and large-frame G-Series skid steers and compact track loaders (CTLs), with a WorkSite Pro attachment to help with his project, “Rising Above the Ashes.” This project helps residents of Black Forest, Colo., clear their land of dead, dangerous trees, resulting from the most destructive fire in Colorado's history. The June 11, 2013, fire spread across 14,000 acres in 10 days, destroying more than 500 homes, causing $85 million in damage and claiming two lives. As a result of the overwhelming response to the contest, John Deere also announced that it will help the two runner-up finalists in completing their community projects with a yearlong lease on a skid steer or CTL from John Deere Financial. The runners-up are Kobus Appelgrijn of New Port Richey, Fla., and Anita Will of Ridgefield, Wash. Through West Pasco Habitat for Humanity, Appelgrijn's project, “Restoring Neighborhood Pride,” uses the help of more than 50 volunteers to revitalize 40 badly deteriorating homes to help create a thriving community. Will's project, “Trailblazing Outdoor Connections,” is transforming Whipple Creek Regional Park from a dilapidated area into a community staple, with more than 8,000 volunteer hours donated since restoration began in 2011, growing annual visits from 1,000 to 54,000. Additionally, all three finalists will receive a $2,000 stipend to help in the completion of their projects, donated by John Deere and their local dealers. These finalists' local dealers are: 4Rivers Equipment in Colorado Springs, Colo.; Dobbs Equipment in Lutz, Fla.; and Papé Machinery in Portland, Ore.
John Deere launched its second annual “Small Machines. Big Impact.” contest on Jan. 23, 2018, at World of Concrete. From Jan. 23 to March 16, individuals from the U.S. landscaping, agriculture, construction and rental industries were invited to submit an entry detailing what kind of impact they would make in their community with a G-Series machine. Online and text voting was then opened to the public from June 4 to June 24 to help choose which of the finalists' community projects would come to life with the power of a G-Series machine.